Minnie Mouse Birthday girl Shirt with name and age, Minnie Mouse Family Birthday shirts by Party Style Store at Nicky's Blog. Hurry! Limited time offer. Offer valid only while supplies last. Minnie Mouse Birthday girl Shirt with name and age, Minnie Mouse Family Birthday shirts is completely customizable with your child's name and age. 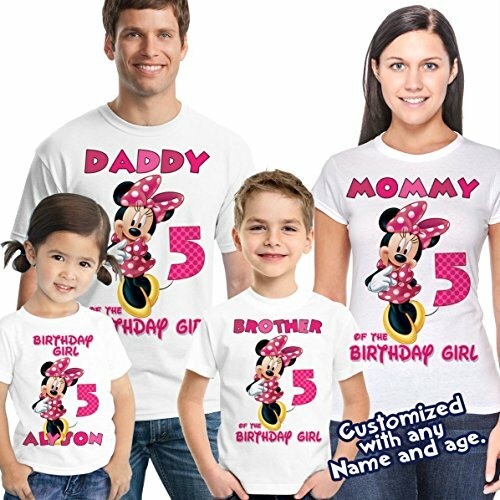 Minnie Mouse Birthday girl Shirt with name and age, Minnie Mouse Family Birthday shirts is completely customizable with your child's name and age. The personalized applique is adhered to the shirt using a commercial grade heat press making this shirt durable enough to withstand the wear. Please see the size chart below for the t-shirts and choose your options in the drop down menus. We will ship in 1 business days. VISIT OUR SHOP! Other characters available! Unicorn Birthday Shirt, Family Birthday Shirts, Unicorn Princess, Unicorn Party Favor, Add ANY name and Age, Unicorn Princess Birthday Shirt, VISIT OUR SHOP! !